Time is the greatest of con artists. We joke around with each other by saying, "hey, look over there," in a silly attempt to take a French fry, or to put a gum wrapper in the dupe's pocket. We do it knowing that they will see what we do, knowing that it's funny to pretend that the most intelligent creature on earth, presumably, could be dislocated from their personal awareness by a simple distraction across the room. "Oh, look at that girl!" Swipe. We posture at how smart and wise we are, at how invincible to the ravishes of cunning we can be, but all the while a fearsome, abstract monster is slowly bleeding us. Time. The greatest con artist: You know he is stealing from you, and he tricks you over and over into thinking that he has left you alone, but over and over again you wise up to his ways. Nevertheless, you can do nothing about it. He says, "Oh no, you won't even know I'm around," but then six months later... six months have passed, and you could have sworn that those six months were merely a blink and a short nap. Well, today is the official half a year anniversary of my becoming a citizen of Israel. The tone of what I just wrote probably sounds non-celebratory, but don't mistake my thoughts on time for my attitude and perspective of my time here. That is the entire point, that time is a wily beast, striking when you least expect it. Hence, "time flies when you are having fun." Hence, I'm having a great time, I have been having a great time, and all of a sudden six months have passed! Wasn't it yesterday that I was playing Xbox with my brother? Wasn't it yesterday that I drove to the movies in my green Jeep? This seems like some type of a milestone. I'm not sure what it's really symbolic of, whether it's permanence here, or that I endured some big hurdles in the transition inherent in moving 7,000 miles - and overcame valiantly. Or, maybe it means very little, and I'm just making a big to-do about nothing. Whatever the case may be, I can report home in a positive manner: Doing well, got food, have friends, staying busy, will call. So, you may be wondering what those pictures are doing here. 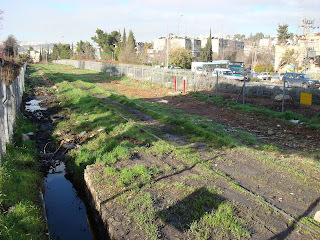 The first two, of the railroad tracks, are disused French-built rail lines in Jerusalem (according to nabataea.net, a pretty neat site). 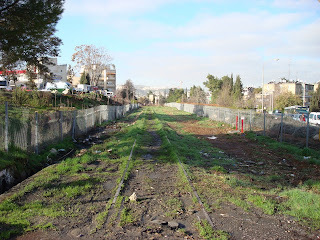 In fact, on my short walk from the bus stop to the building where I have Hebrew class, I have to pass over these tracks. This area of town is right next to the old train station, a remnant of the Ottoman history of this place. I have unfortunately not taken a close look at the old station, which is actually rather large, and I plan to explore it ASAP. I've wanted to do that for three years. I walk over these tracks every morning and every afternoon. The sun is still slanting across the new-born sky when I make this trek, and the silhouettes of the trees fall on the tracks in a way that makes the morning feel like eternity itself couldn't exist longer. Time stands still, if that's possible, and the shadows stretch away the weariness of night. I walk over these tracks, covered in moss and deteriorating for half a century of neglect, wondering how many pilgrims made their way to the Holy Land on them. This was the line from Jaffa to Jerusalem, so I wonder if Mark Twain would have found his way to the true City of God on this very spot, if he made his journey thirty years after he did. Would he still have seen the land as "a desolate country," or would the railroad have convinced him otherwise? I wonder many things when the sun casts shadows on these tracks, and I can't help but smile at the beauty of the life that we so often take for granted. How many people walk over these tracks and aren't amazed at how old and historic they are, terrified of the tears and blood and rain that have washed away so many lives, at what a witness these tracks must be for the history of a nation and a people, at how symbolic it is that they have been paved over by the new asphalt roads, at how romantic the times used to be, before we lost our way in modernity. I wonder many things in this city. In this country. My soul has yearned for many years to feel a part of something so surreal, to walk from the rigors of daily life into the ether of history, to let my mind not just wander to a distant land full of stories too fabulous to be true, but to let my mind walk that land and tread those fables. That's why I moved here, or at least that's one of the reasons; to wake up in the morning to my dreams, not from them. The other picture below is somewhat humorous to me. I was walking home from class when I looked down, bewildered by a rush of nostalgia, and saw what had caused this remembrance. 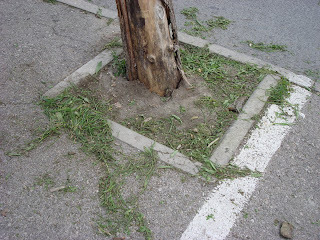 There was freshly cut grass along the paved sidewalk, which instinctively placed me back in my parent's house, six months previous, where I spent the summer as their lawn-boy. The smell of cut grass = my parent's yard. Can't say that living in a city hasn't been the hardest transition for me, I have to admit. I get along just fine in cities, but there's something easier about open fields, tiny villages, and nature's permeation.